SNAFU! : Fixing the fleet. 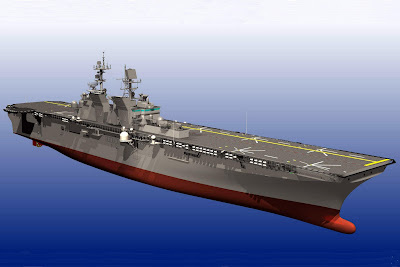 USS America class should be the next carrier. Fixing the fleet. USS America class should be the next carrier. During the aftermath of the earthquakes in Haiti, the US Navy rushed an aircraft carrier with a skeleton crew on board to provide assistance. It had no manpower to search for survivors or provide assistance. It didn't have helicopters to move supplies ashore. It was a case of image over substance. All this leads to the situation the Navy finds itself in today. Too few aircraft, too much ocean and not enough ships to go around. The solution is simple. Fix the Navy by adding an angled flight deck to the America class LHD and get numbers, reinvigorate rotary winged aviation in Navy use and get almost 40 F-35C's (or F/A-18's) on board. Oh and be advised. We've done this before. We did the same thing to straight decked aircraft carriers after World War 2 and we were served well by the modifications. Putting angled flight decks on the America class would be the first step to the Navy buying Ford's not Ferrari's. We should start the planning today. A world war 2 aircraft carrier was under 30,000 tons in wieght and carried 100 aircraft. When they were refitted witth hurricane bows and angled flight decks they still came in under 50,000 tons and operated primitve jet aircraft...meaning weak engines and avionics. We can make a 40,000 ton carrier with an angled flight deck out of the America class and still operate 50 aircraft. If we take the space used for Marines and equipment then its beyond doable, its easy! It can be done today, all it takes is the will. Throw in a nuclear reactor or two. If this ship is supposed to last forty years through ever rising fuel prices it's going to need them. That and increasing automation. Also, stretch it out to 920 feet and 65,000 tons. Sound familiar? yes on the nuclear...no on the stretch. oh and no on the increasing automation. until robots can fix broken ships and paint hulls we need full manning. and we don't need to do the Brit thing with an increased size carrier. i checked out that concept and the only reason why i want angled flight decks is so the US Navy can operate f-18's. even with the extra length and tonnage the Elizabeth class won't carry more fighters than the America class will in its sea control profile. this is one of those few cases where smaller is better. 1000 men (just the ships crew, no the Marines) cost a lot of money, especially when their salaries rise every year. And they take up space which could be used for more aircraft or munitions storage. We need some degree of automation. With nuclear reactors the fuel cost stays relatively flat. Without automation the crew cost rises, rises and rises. We need to find someway to reduce the crew and spread the number of people who would have been manning that ship to other America-class ships across the fleet. Oh and I wanted the stretch not only for increased aircraft storage but also increased aircraft landing spots (think eight CH-53Ks) and more space to put CIWS on (RAM or Phalanx). Now that I'm thinking of it, redesign the island a-la Gerald R. Ford class so we can have more flight deck space as well. How many cruisers, destroyers, frigates and attack submarines will be protecting this ship. Will it just be another CSG without the supercarrier? Dude, what do you think of this? Modernized and nuclear Midway-class aircraft carrier? 60,000 tons, angled flight deck, comes with all the modern and fashionable amenities of the America class but with 55 aircraft. (Evil laugh) IT's BRILLIANT I SAY! Also, bring back the S-3 for both the Nuclear Midway and the Gerald R. Ford. The carrier group or amphibious assault group needs more dedicated ASW assets in my opinion. Wherever I said Midway scratch and replace with Forrestal. Once you start playing in the CATOBAR world, a lot of the "bigger is better" arguments start to make sense, as does the case for nuclear power. There is also the issue that good CATOBAR carriers make bad amphibs and vice versa: the America Class has already taken hits for trading off a well deck in particular for aviation stores. This is why I'm not sold on using the America class. Once you go down to an all STOVL/VTOL force, however, the arguments for size and nuclear power are less compelling, the well deck issue is reduced, and, with a ship designed for modular storage, the stowage tradeoffs for amphibious vs. aviation stores would be more tractable. That's why I like the idea of a hull the size of the Invincibles (20-25K tons) that could be used for both a ship able to flex between sea control ship and LHA and as the basis for a strike cruiser, along the lines of the Kirov class but a little smaller. These two types of ships would give the navy a lot of flexibility for power projection and sea control while maintaining, through the LHA-flex, a lot of capability for supporting amphibious and disaster relief type operations. For about the same 45K tons, you could have enough AEW/ISR Ospreys for over the horizon targeting and a bunch of cruise missiles for the strike, a solid alternative to an air wing in many circumstances. Through in a few F-35Bs for low to medium intensity work on its own and you would have a very flexible force. Plus the strike cruiser would be a great flagship for amphib groups that don't rate a CVN but still need powerful naval support and C&C. it doesn't necessarily have to cost a ton of bucks. remember the America class is aviation centric in its design. being aviation centric and actually supporting new missions with a a different set of a/c is a very BIG difference from the capability viewpoint. I agree with you about the "too many eggs in one basket" but there is more than one way to look at that. One is the vulnerability vs. capability argument. Here reduced vulnerability, by splitting assets among multiple carriers instead of one super carrier, is good but is actually more expensive in terms of capability, not less. No emphasis on vulnerability but lots on air power delivered is what led the US to super carriers as the most efficient solution in the first place. So I'm agreeing reducing vulnerability by multiplying platforms is a valid objective, just pointing out it costs money, as opposed to saving money, for a given level of power projection. The other aspect of the "eggs vs. baskets" argument is the old saw that to keep one ship on station you need 3 (one on station, one in transit, one in refit). This means we run out of air capable ships frighteningly fast when faced with dispersed low to mid intensity trouble spots and/or disasters, many of which do not require a full carrier of either 45K or 100K tons. This is where I see Invincible size carriers fitting in: they do not have to absorb the CATOBAR overhead that dogs the efficiency of 45K ton CVs and are big enough to be capable but small enough to be affordable in numbers. The small carrier / LHA flex gives them strategic flexibility over their service lives as well. Firstly, you'd need so many modifications to LHA-6 to turn it into a carrier you're better off starting from a clean slate. Just consider the modifications to the engineering spaces in that you need to increase speed from about 20 knots to 30 and increase electrical generation for all the new systems you're adding. Secondly a 45,000 to 50,000 ton carrier can not operate 50 aircraft. The 42,000 ton Charles de Gaulle operates 28 to 40 aircraft and is considered too small (and operating 40 aircraft includes some rather small aircraft like the Super Etendard) and the French Navy plans for their carrier of 65,000 tons to operate 40 aircraft which includes the fighters, AEW, and helicopters. The UK, France, and India all either are building or plan on building 65,000 ton carriers. These get you 36 or less F-35 size aircraft. Looking at the number of aircraft operated at a particular time in history doesn't tell you very much. The Midway Class, frex, were too small to operate F-14's. The A-4 had a max take off weight of about 25,000lbs vs the F-35C at 70,000lbs. The size and weight of the aircraft directly impacts how many can be operated by a particular carrier. Moreover, if you don't have nuclear power in your carrier then in addition to the extra escorts and combat replenishment ships for your new carrier battle group you additionally need more oilers. This subtracts from time on station as well. I don't know how many F6F's or A-4's the UK's new carrier can operate but it's designed at 65,000 tons to operate 36 60,000 to 70,000lb aircraft. Lane I agree again. One HAS to look at the rqmts and the platform before deciding if a CVN can be replaced by a CVL nee LHA-7. I am not disagreeing with Sol that smaller carriers can/should supplement CVNs, I am just saying that ship conversions cost a helluva of money and like you beleive a clean design start is needed. AND I refuse to argue for ANY ship program coming out of HII Ingalls. It is a failing yard IMHO. The future CLF has not been sized to support our current fleet much less more conventional hulls - that I know. you're complicating the matter unnecessarily. our super carriers operate with approx 60 fighters today when they could easily handle over 100.
just like us, the other forces you named are constrained by budgets for aircraft more than they are by the size of their carriers. a quick honest assessment of the LHA shows that even in a sea control role it could handle far more than the 20 plus aircraft that the navy is quoting. additionally, like i said the lha is aviation centric in its design. making modifications to it should be simplicity itself. its always easiest to say why something can't work, when all it takes is a bit of ddetermination and a little bit of work to make it happen. the problem is most people are unwilling to even try. I'm not sold on nuclear-powered surface ships. There are tons of direct and indirect costs. I don't think even the fully-burdened cost (including fractional oilers) to deliver the fuel needed for a CV outweighs the life-cycle costs of a CVN. I know the Navy believes otherwise, but to my knowledge, they have never released their analysis for independent verification. I'm not a fan of CATOBAR-izing an LHA. As Lane said, way too many compromises. Might as well design a CV in the size range you want from scratch. Instead, I'm in favor of developing a conventional Ford variant. Let Ford prove all of the advanced systems, and at the same time develop a lower-cost CV based on the same design. means a CV fleet could have significantly higher operational availability. And lower cost means more ships, or more something else. Midway size CV, air wing of 65 aircraft, good defense against cruise missile attack, and would be relatively cheap. The notion that a modern 65,000 ton carrier can operate 65 aircraft when every other modern 65,000 ton carrier is designed to operate a max of about 40 aircraft (32 to 36 fighters) is ridiculous. Carriers are larger today because both the aircraft are larger and everyone has determined that they want the carriers to operate for at least a week before having to come off station for replenishment. I'm not sure a Nimitz class could operate 100 aircraft. While we used to go up to about 90 the aircraft the light attack wings F/A-18A/C's or 50,000lb aircraft. The F-35C is 70,000lbs or almost the weight of the F-14 which was itself too big for the Midway class. This aside the smaller carrier air wings we operate today is the result of post Cold War budget decisions. We're far better off with our carriers being able to operate larger air groups if required, and thus having some reserve capacity, than designing them to operate the current air group. The plan is in fact to grow the size of the carrier wing with the introduction of the UCAS-D(X-47B follow on) detachment. The arguments over nuclear power should include additional factors including the ability to strategically deploy, the reserve electrical generation capacity for future growth (EMALS, energy weapons, etc. ), the comparative size of engineering spaces for both plus fuel storage for conventional ships, etc. Nuclear power brings a lot of capability, saves space aboard ship, and eliminates the need for carriers to refuel lowering time spent replenishing as well as requiring fewer ships. The USN in fact long has required 2 nuclear powered escorts per carrier which they've never gotten. The resulting strategic mobility would in fact be stunning and be a huge force multiplier. I believe the USN has done comparative life cycle costs and found CVN's cheaper. Maybe focusing upon other criteria could favor CV's? It's an interesting question but it's not simple analysis. Sol it's not remotely simple to covert an LHA to a CATOBAR carrier. It's an entirely different design with totally different engineering plants to both make the ship go 50% faster and generate far more electrical power (EMALS among other myriad other added systems). It really is designed to operate 20 F-35B's and 6 helicopters in a sea control configuration or 32 mostly helicopters. The change you'd need to operate say 40 fighters, doubling current capacity is immense in terms of aircraft handling, the plumbing for additional fueling points, additional ammo storage and elevators to move to the additional refueling and rearming points, etc. The question has nothing to do with LHA-6 per se. The issue is should the USN continue to operate 100,000 ton carriers or smaller carriers? If they should be smaller then what size? Now is that requirement better served with a clean slate design or the modification of an existing ship like LHA-6? Finally it's worth pointing out the AV-8B is a 30,000lb aircraft. The F-35B is a 60,000lb aircraft. Ships able to operate X number of the former can not operate X number of the latter. I know the Navy has published some high-level dollars per barrel figures indicating the threshold where nuclear power becomes less expensive. Personally, I'd like to see the analysis behind those numbers, or let an independent body like the GAO verify them. A while back we had the same debate over at the USNI Blog. I posted a GAO study from 1998 about the cost effectiveness of nuclear vs conventional carriers. From that thread I added, "
I took the GAO costs for a CV vs a CVN (page 74, minus fuel) and adjusted for inflation from FY97 to FY10. Instead of the $70.02/barrel of crude assumed there, I used an average of $112/barrel. The GAO assumed 25 million barrels of fuel delivered to a CV over its lifetime. There’s a HUGE YMMV with all of this, of course." So if you believe my numbers (a huge, 100,000 ton "if"), for the total life-cycle cost of 10 CVNs, we could have 13 CVs. I'd be willing to accept a bit less capability per ship for three extra carriers. Or we could have 10 CVs and spend the extra money on aviation. Or use the savings to offset the budget ax (which is coming). Note: I did not take into account the extra, indirect cost to our nuclear submarine programs to offset the loss of the CVN reactors. I would like to see an updated version of the GAO analysis that didn't use back-of-the-napkin calculations. Strategic Deployability: CVNs can deploy faster, but they are hampered by their escorts' requirements to take on fuel, just like a CV. We won't be building any nuclear powered escorts, so the difference is not as great as it could be. Electrical Generation: An IEP power grid can provide the same power as a nuclear grid, you just need to design in the capacity. Engineering spaces and fuels storage: A CV of the same size may be somewhat less capable than a CVN. However, as the GAO document shows, the difference in actual operational effectiveness is marginal. There's all sorts of analysis I wish were public and this is certainly one of them. Also I entirely agree we're very unlikely to get nuclear powered escorts and that the lack of them reduce the strategic advantages, somewhat, for our CVN's. Unless of course we actually start building more DDG-1000's at $3 billion and someone does the math and realizes a CGN/DDGN isn't going to cost much more. There are of course other savings, as you indicate, as well as not requiring more oilers just for the carriers. The main factor in my view is that we can't afford to operate more than ten carriers. We simply don't have enough escorts and SSN's. Moreover, we only managed to keep 10 operating by retiring all our older aircraft that had higher cost per flight hour and entirely doing away with the asw/patrol community as well as the medium all weather attack communities. Sure you can generate the electricity but how does the space and manning requirements compare? It was my understanding the new reactors on the Fords were going to cut manning in half, provide 25% more shp, and support a three fold increase in electrical power over the Nimitz class? I thought the nuclear plants take up less space especially when considering fuel storage? Is it possible there are other design considerations the public isn't privy to? As far as your docs does a FY10 CVN really cost double vs a CV? That seems a bit high perhaps? In any case thanks for posting all that. If you believe my numbers, 10 CVs are still cheaper to buy and operate than 10 CVNs. That means more money for other priorities (e.g. aircraft). Space and manning: My guess is a CV will require more space for the propulsion plant and fuel. The GAO compared manning between a CV using a steam plant and a CVN and found the CV required around 200 fewer sailors, IIRC. Yes the Ford class plant requires fewer sailors than a Nimitz plant, but a modern diesel/turbine conventional plant would require far fewer sailors than an old steam CV plant. Also, CVNs require more expensive, nuclear-trained and qualified sailors. So even if a CV and CVN required the same number of sailors for propulsion plants, the CV would still cost less to man. I went by the GAO numbers for the price of CVs and CVNs. They used historical information to determine the prices differences, which may or may not be a good measurement. If the overall percentage cost of non-propulsion components has risen since then, the difference in price between a CV and CVN may not be as great. explain the statement that our current cv' aren't right sized for the mission.